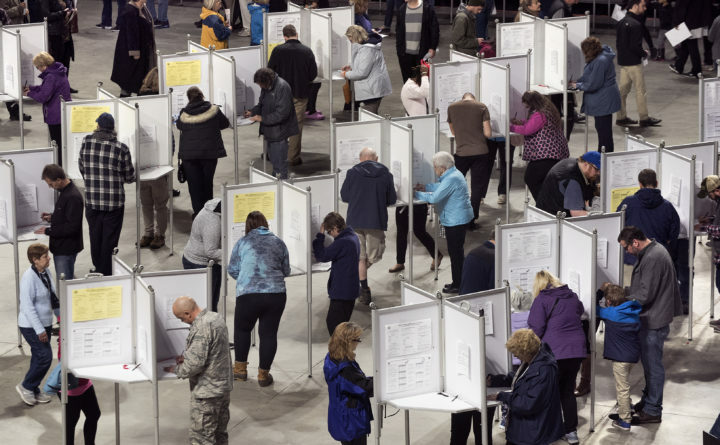 People vote at the Cross Insurance Center in Bangor Tuesday afternoon. Two incumbent members of the Bangor City Council were elected to additional three-year terms, while a newcomer is also poised to join the council after Tuesday’s election. Sarah Nichols won a second term, while David Nealley will serve his third consecutive and fifth overall term on the council. Nichols received the most votes in the race, 6,407, while Neally earned 4,515, according to unofficial results released several hours after the polls closed Tuesday evening. The third most votes, 3,480, went to Gretchen Schaefer. That was just 10 more votes than candidate John Cashwell received. On Tuesday, voters also chose two candidates to serve three-year terms on the city’s school committee, Warren Caruso and John Hiatt. They were in a three-way race that also included Ken Huhn. And the city’s voters decided to return every member of their state delegation, all Democrats, to Augusta. State Sen. Geoffrey Gratwick, D-Bangor, a retired rheumatologist whose district, Senate District 9, also includes Hermon, fended off a challenge from Republican Jim LaBrecque. State Reps. Barbara Cardone, Victoria Kornfield, Aaron Frey and John Schneck also defeated their challengers. Frey’s district also includes a part of Orono. A total of seven people were running for three seats on the City Council. The other candidates were Cashwell, Allen “Seth” Braun, Nicole Golden-Bouchard and Amy Lee Tidd. One member of the council, Joe Perry, did not run for re-election. Nichols, 28, works for the Maine Education Association in Augusta. She supports expanding public transportation in the city, creating municipally funded broadband infrastructure and exploring ways to build affordable housing. Nealley, 57, works as the publisher of Maine Seniors magazine. He favors limited government and has said that he would like to spur economic development, but not in a way that burdens taxpayers. Schaefer, 43, views Bangor’s affordable housing crunch as the biggest problem facing the city and would also like to push for municipally funded broadband. She works at Husson University, teaching at the School of Education and helping faculty to integrate technology into their lessons. One of the newly elected members of the school committee, Caruso, has previously served on the body. He wanted to rejoin the group with two broad goals for the district: securing more state funding and helping the district grapple with changing state and federal assessments of students. Caruso, the director of major gifts and the men’s basketball coach at Husson University, received 6,452 votes, according to unofficial results. The second highest number of votes, 5216, went to Hiatt, an educational technician and licensed behavioral health professional who works with students with special needs. Hiatt has said that he would like the district to offer more classes in basic life skills, such as cooking and balancing a checkbook. He also would like the school committee to hold more public comment sessions during its meetings in order to be more transparent. The third candidate for the school committee, Huhn, received 4,522 votes, according to unofficial results. Correction: An earlier version of this story misspelled David Nealley’s last name and misstated the length of his council service. He’ll be serving his fifth overall term.